DD5LP/P – June 3rd. 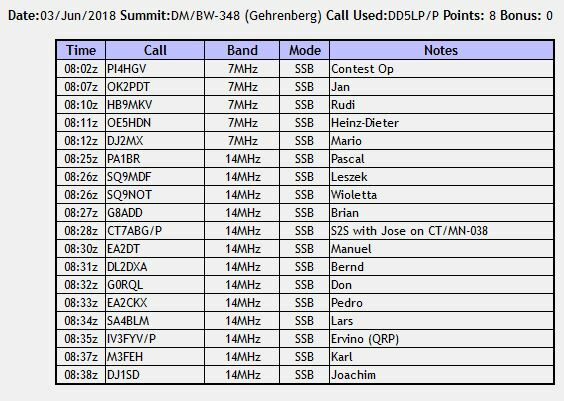 2018 – DM/BW-854 Hoechsten & DM/BW-348 Gehrenberg while attending HamRadio FN 2018. Since the previous year when only one summit was easily reachable from Friedrichshafen following the removal of two summits from the SOTA scheme, a new SOTA Summit “Hoechsten” has been added making it relatively easy to activate two 8 points summits while attending the Ham Radio Hamfest in Friedrichshafen. To this end I booked a hotel about 15 minutes drive away from the new summit. The original plan was to activate both summits on Friday afternoon prior to the annual SOTA Dinner that I had arranged again, However the weather forecasts were predicting serious rain on Friday, so I changed my activation plans to Sunday morning. In the end NO rain came and all three days were sunny and warm. My intention was to have group activations of both summits, with S2S contacts between them however when I saw the weather, I suggested all make their own plans. Several stuck with Friday afternoon and enjoyed some nice weather and lots of contacts. Some planned to activate at least Hoechsten prior to or after the Ham Radio event as they were taking a longer holiday in the area. My revised plan for Sunday morning was adjusted to fit in with some of the ICQ Podcast team who I was working with to get interviews for the podcast, so they could also take a look at a SOTA activation. The final plan was that I would activate Hoechsten before breakfast on Sunday, then return to the hotel, have breakfast and check-out, then go and pick the guys up and head up to Gehrenberg and when finished go back to Ham radio for a couple of last interviews and then take and drop them off either at the ferry to Switzerland or Memmingen airport. That is finally what came about. Hoechsten was about 15 minutes drive from my hotel near Wilhelmsdorf and the closest hamlet is Glashuetten. From the car park to the summit is an easy 5 minutes walk up to “Aussichtspunkt Hoechsten” (in fact not to block the lookout point I went past it to a larger grassed area behind the lookout). Gehrenberg is a few km north of Markdorf and is approached best from a small road just on the southern end of the village of Harresheim (make a note of this as every Navi/GPS I have used has taken me to the wrong location!). It’s about a 10-15 minute walk from where no motor vehicles are allowed, up to the summit. I usually activate near the base of the radio tower (which well within the AZ) but this time I decided to follow the track up through the forest to the actual summit. I woke before the alarm went off and was underway to the summit before 6am. The navi takes a while to lock onto satellites but I didn’t want to wait with the engine running in the hotel car park and wake the other guests up, so I set off in the rough direction that I expected the summit to be. Once the Navi locked in its satellites, I was one village past the turn off I needed, so I had to turn around and head back. From there on the Navi diligently lead me up the (small) roads to Hoechsten and I came out at the road junction across from the car park. I could just see the small bandstand like lookout building through the trees. Not as obvious as I was expecting it to be, but sign-posted from the car park. So I unpacked the usual two SOTA bags and the Surveyors tripod which was a new addition to the kit. It stands about 1m 80cm high, has spikes on the legs and a hole through the mounting plate where a theodolite would normally be mounted. I have also added a pass-thru SO-239 double socket for use with mobile HF whips but today it would act as a simple support for my fibreglass fishing pole meaning I would not need to seek out a convenient fence post or tree to fasten the mast to and can position it where I want it. I was set up and calling CQ SOTA by 6:15 AM but unfortunately with no response. Despite putting up spots for 40m and 20m on SOTAWatch, I was getting no calls, so I decided to tune around to see if any “normal” stations would be willing to talk to me. Several I called either couldn’t hear me or simply ignored me as I wasn’t “DX”. I was glad when Fabio II4AMP cheerfully came back to me and gave me a “True 5-9” he was well over 5/9. So it seems the gear was working OK, after some more attempts at calling what turned out to be contest stations and another spot Jan OK2PDT a very active SOTA chaser came back to me but it seems he was the ONLY SOTA chaser who was out of bed that early on a Sunday morning as the other two needed contacts came from a contest station and a friendly Greek station just looking for contacts. With the delay in getting the minimum 4 contacts (which took me over half an hour), I was now going to be tight on my schedule for the rest of the morning, so it was a quick pack-up (the new tripod being quick to set-up and take down helped somewhat), back to the car and back to the hotel for breakfast which started at 7:30am. I arrived back at the hotel at 7:29am, went up and brought my case down into the car and then went to breakfast. At 8am I was checking out and off to pick up the other guys from near Friedrichshafen. I arrived a few minutes earlier than planned into Burg and the extra time was not a bad situation as Colin M6BOY and Chris M0TCH (the ICQ Podcast guys) were already just about ready to go. So off we went with the Navi now set to Gehrenberg. All was well until in Markdorf (near to the summit) I missed one small turn off and the Navi said “re-calculating route”. In hindsight it would have been best to turn around and return to the exit as the Navi now took us to a road at the other side of the summit from where access is not possible. I recognised this and after 5 minutes referring to maps on smart phones, we were off again to hopefully go around the end of the hill, to the correct road towards the summit. This was not to be our day as we went past the exit, which I realised as we came to the hotel that I had used last year for the SOTA dinner. Another stop and look at maps to see why we had missed the exit. The key point is that the small road needed is at the very southern end of the village of Harresheim, whereas the maps were showing it as outside of the village. Another thing to look for is signs for “Sturzhof” this is a building just past the corner where the track goes off up to the summit. While there is no red circle sign, there IS a sign that says only Forestry vehicles are allowed past this point. Last year (and I suspect this year as well) several cars drove up the track all the way to within 50 metres of the summit. I normally set up on some flat land near the bottom of the radio tower but as Luc ON7DQ told me last year that a few more minutes up the road, there was a track up to the actual marked summit, I decided to we’d check that out. It took about 15 minutes from where I parked the car just off the road to the summit. It is quite a steep track but with two extra willing pairs of hands to carry some of the gear, it was a reasonable walk up to the summit. The summit is totally forested, so no interesting views from it and it is also on a favorite track for cyclists, so I had to be careful where I strung the dipole out to! We were at the summit just before 10am. The new tripod again proved a great advantage as there were no obvious places to strap the mast to and with the tripod I could position the antenna to be out of harms way for the cyclists (and my antenna). The radio and its battery box were placed on the large stone on the summit and the antenna connected. On 40m there was an S7-S9 noise level – I suspect coming from the microwave radio link tower although there were reports of the bands being noisy as a lot of solar debris was hitting the Earth’s atmosphere at the time. In any case after some spots to the SOTAWatch website and tuning around I managed a few contacts on 40m. these would have been enough to get the points for activating the summit but as Chris was recording the activation for a possible feature on ICQ Podcast I thought I should try for some more and switching to 20 metres immediately dropped the noise level. It was at this point however that I saw that the SWR was over 2:1 on the antenna, which normally sits between 1.2 & 1.5:1. I’ll need to investigate that. In any case I managed to get a good run of contacts going and at the end we worked a total of 18 stations across Europe. This again had taken more time than expected and after packing up we got back to the car at about 11:00 am and then drove back to the guys apartment to pick up their luggage and the 4th. member of the team Conor, Colin’s son. So by the time we got to the show again it was 11:30 and we needed to leave for the airport at the latest at 1pm, so there would not be a lot of time to do anything. As we went into the halls about 25% of the stalls had either already or were starting to pack up in any case. One last interview went into the can and we were ready to leave. A very busy day but well worth it. LambdaHalbe 6m telescopic fishing pole. Battery box with 2 x 5Ah 4S LIPOs and regulator to reduce voltage to 13.8v. I may have a problem on the Aerial-51 dipole which I will need to investigate for a bad connection causing that 2:1 SWR. The surveyors tripod was a real success but I may add a small plug or plate to reduce the size of the hole in its centre. Shade is definitely what is needed to make the display on the X108-G visible. When Chris stood in the way of the sun, the display was perfectly readable. I ordered a small sunshade for the rig (really meant for a camera LCD screen) which arrived while I was away, so I will try that to see if it gives me a solution. I’ll try to remember NOT to use the Navi, the next time I am heading to Gehrenberg! This entry was posted in SOTA and tagged DM/BM-854 Hoechsten, DM/BW-348 Gehrenberg, SOTA by VK2JI DD5LP G8GLM. Bookmark the permalink.